Of Fathers and Sons release date was Friday, November 16, 2018. This was a Limited in theaters release. After his Sundance award-winning documentary Return to Homs, Talal Derki returned to his homeland where he gained the trust of a radical Islamist family, sharing their daily life for over two years. 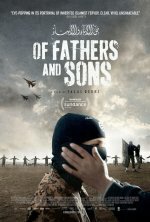 His camera focuses primarily on the children, providing an extremely rare insight into what it means to grow up with a father whose only dream is to establish an Islamic caliphate.